Long before the East End acquired its reputation as London’s working-class quarter, it had a different character. Walk along the Mile End Rd today from Whitechapel and, even after so much has been demolished in the interests of supposed urban regeneration, you will spot surviving signs of grandeur. Trinity Green, the last remaining set of almshouses, is still intact, as are a few eighteenth century private houses further east, two with central porches and elaborate iron-work. There was once a particularly large and splendid one of the same kind on the south side of the road too, built by the rich widow of an East India Company director, but of that no trace remains. By the second half of the eighteenth century the area was becoming built up, with the City of London spreading out - just as it does today – and the London Hospital already established, yet it was still a ‘nice’ area for comfortably-off people. It was also particularly convenient for those whose interests lay in ships, with the Thames wharfs not far off. 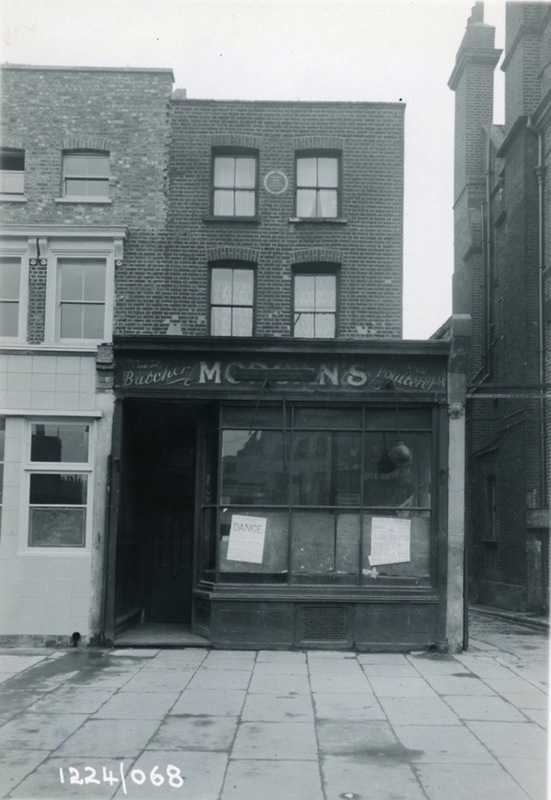 A property developer with the evocative name of Ebenezer Mussell acquired a strip of land in the seventeen-sixties between Mile End Green, which already had some substantial houses along it, and Mutton Lane, which much later would become Jubilee St. He called his new terrace on the main road, Assembly Row, yet he took his time building it, using several different builders, so the houses were not all to the same design. In the usual way of the times, it was the builders who sold them off on long-term leases. In 1764 a sixty-one year lease on the eight-roomed end house, near the one owned by the East India Company widow, was bought by a thirty-six year old called James Cook. He was a Yorkshire boy by birth, son of an agricultural labourer who had risen to become a farm foreman. The farmer’s wife taught the boy his letters and, realising how bright he was, arranged for him to go to a charity school. Later, when he was apprenticed to a shopkeeper, his master noticed the same thing and got him a place with a Quaker shipmaster in Whitby. After that, after a spell as an ordinary seaman and experience in a brief war with France, Cook’s career as a determined and visionary navigator began to unroll without a backward glance. He became well known to the Admiralty and members of the Royal Society. He had been living in then-rural Shadwell, with his young wife Elizabeth and their first child, a son who had been born while he was away on a long, exploratory voyage round Newfoundland. But now he had acquired the grander Assembly Row house. Four years and three more children later he was preparing for the first of his great scientific journeys to the Pacific, accompanied by botanists and an astronomer. He insured the house for £250, his household goods for another £200, and the family’s clothing and silver for additional amounts. Given that in those times £50 a year was a sufficient family income for a modestly respectable lifestyle, with a servant, these sums suggest considerable comfort. The British Empire did not exist then and the East India Company was – to quote a remark of the time – ‘a ramshackle company trading in tea and opium.’ Pursuing a cloud on the horizon further off than little-known Australia – as Cook did – was an act of curiosity. He did not expect to discover New Zealand. The Maoris he met there living on the shores of the North Island were themselves immigrants who had arrived only two or three hundred years before. After initial problems, Cook and they made friends. The voyage Cook set out on in 1768 did not bring him back to his house in the Mile End Rd for three years. Then he was off again from 1772 to 1775, and again from 1776 to 1780. This last was the journey that carried him to an inglorious death off Hawaii, where he had – untypically – antagonised the local people. Elizabeth did not get news of his death until the following year. She inherited the house and its contents, and received a pension of £200 a year for life from the king. She was thirty-eight and had given birth to six children, three of whom had already perished. Her eldest boy, who was by then a teenage midshipman, was drowned in the same year his father died ended on the other side of the world. Both her other sons who survived birth also died young, one in a violent robbery and the other of a fever. Her only daughter also died. 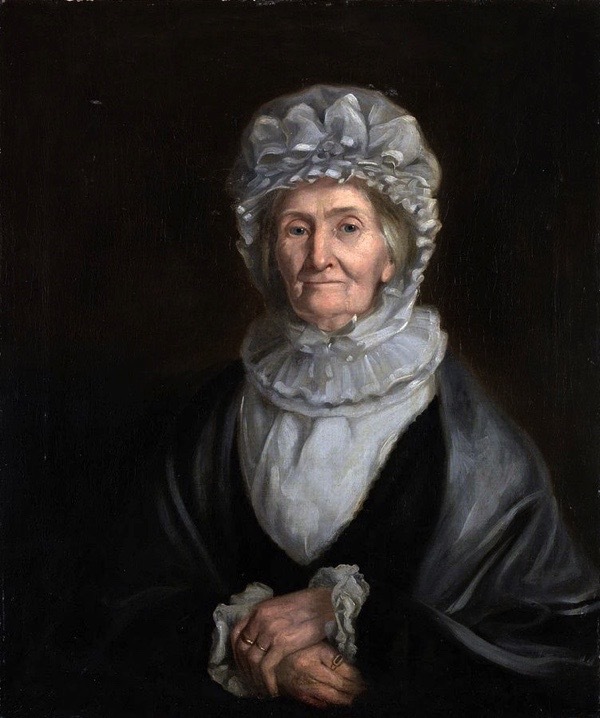 Deeply distressed by these repeated blows of fate, nevertheless she lived on to the age of ninety-three, apparently sustained by her Methodist belief. 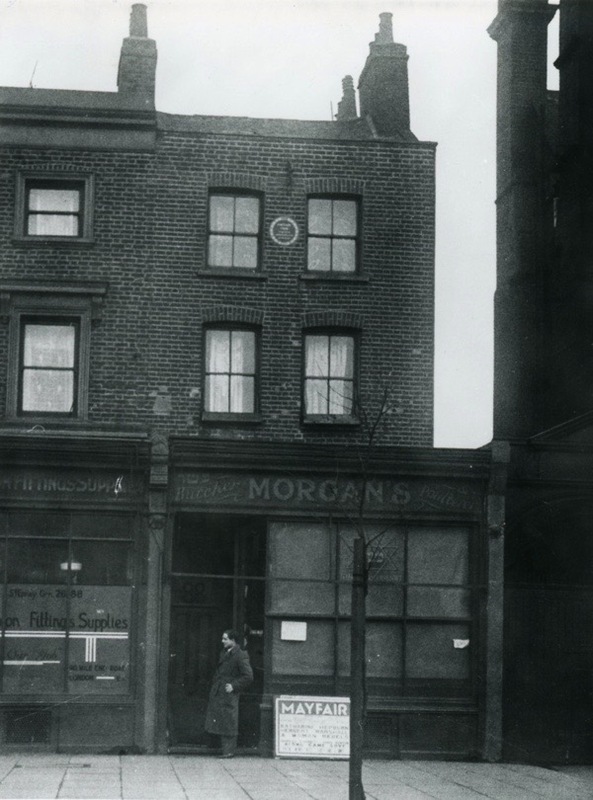 By then, Elizabeth had long since moved away from the Mile End Rd, which had become urban. Later in the nineteenth century, when the grand inhabitants were forgotten, Cook’s house, along with the neighbouring ones, had a shop built out in front. In the early twentieth century, this became a women’s clothes shop – ‘Corsets made to measure a speciality’ – and later a kosher butcher. A London County Council blue plaque commemorating the fact that Captain Cook once lived there was put on the house in 1907, yet that did not protect it from demolition in 1958. It was at the height of post-war architectural and historical destruction, when the Greater London Plan to demolish two-thirds of the Borough of Stepney was being implemented by planners possessing more simplistic political vision than any human feeling or common sense. 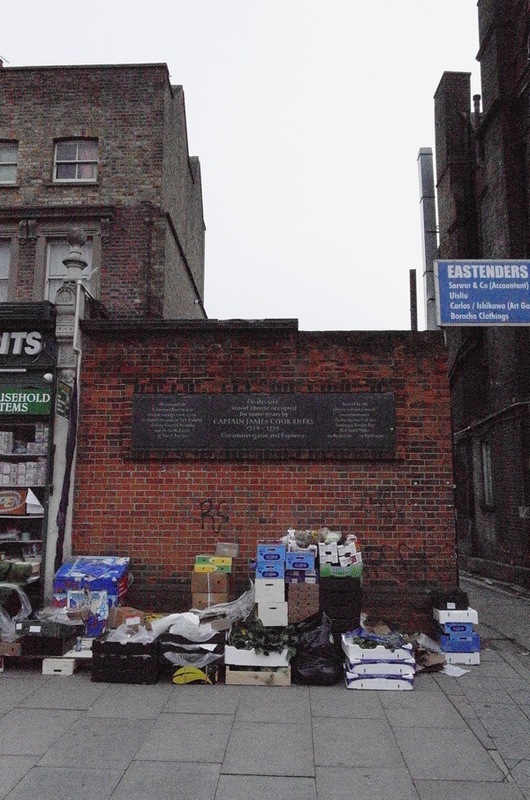 Egged on by ambitious architects and by well-intentioned ‘reformers,’ such as Father Joe Williamson of Whitechapel who seemed to think that Poverty & Sin could be wiped out by destroying the streets where it was currently in evidence, the local authority took high-handed decisions. None of the houses in the rest of the terrace were pulled down – they are still there now. The pretext for destroying Cook’s house appears to have been the supposed need to widen a narrow lane alongside it. In practice, the lane never got widened, its ancient cobbles remain to this day, leading merely to a puddled parking lot and the Seraphim & Cherubim Church. 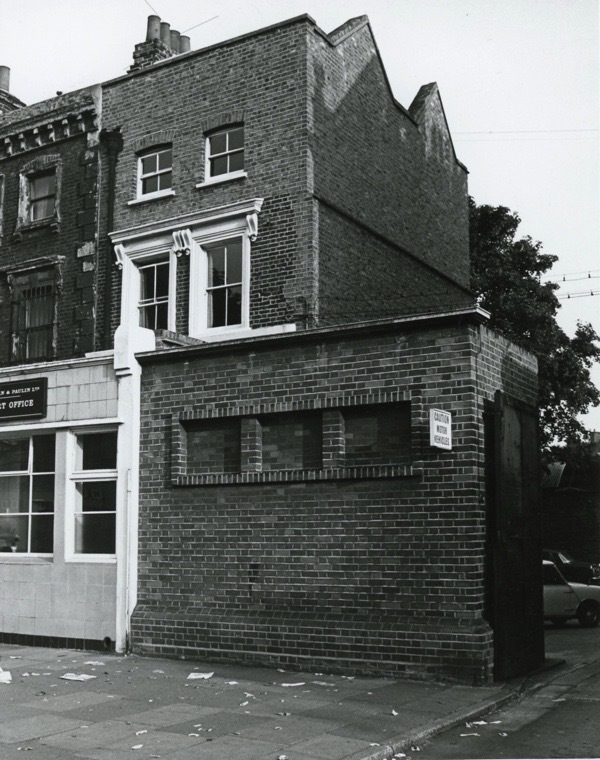 The pointless brick wall that has replaced the house was given a commemorative plaque in 1970, when the enlarged local authority of Tower Hamlets had acquired some notion of respect for the past – yet not sufficient to rebuild the house as it had been or to construct anything worthwhile in the empty space. I will happily join forces with anyone who feels like campaigning for Cook’s house to be rebuilt. It will not matter if the interior is different from the original. What matters to me is to see the exterior reconstructed as it was, with the right twelve-paned windows, and the mutilated terrace restored. The inside could become ‘affordable’ flats or, even better, social housing. Why not? Great piece, proving that game-changers can come from any walk of life, and from any ‘class’. Great idea to restore Cook’s house. After all, his statue cannot even be found at Greenwhich Park any more – what has happened to it? I thoroughly enjoy reading your daily emails. I refer you to the other Captain Cook’s cottage in Melbourne, Australia. See https://en.wikipedia.org/wiki/Cooks%27_Cottage and https://blogs.slv.vic.gov.au/such-was-life/captain-cooks-cottage/, which something to add to the narrative. In addition, you might be interested to know about the single stone bollard with a very tired and worn brass plate on the banks of the Thames near the Tate Britain Museum at Millbank that mentions the place where around 320,000 convicts embarked to be transported mainly to New South Wales and Tasmania, and elsewhere in an effort to cleanse the streets of Dickensian London of the wretched poor and petty criminals who were the social and economic fallout from the Industrial Revolution. The memorial is really not fitting of the “real” birthplace” of the contemporary Australian nation, after giving credit to the previous occupation by indigenous Australians who arrived 50,000 years before Cooke and the First Fleet of convicts. Erect a statue instead. It wld be easier to fund raise for and more emmediatly evocative of the great man. It would certainly be better than that very ugly wall. If you get permission for the statue – & find a sculptor – I will happily make a donation (maybe try David Backhouse -I don’t know if he is still working but brill at people – very sympathetic – lives in the West Country). Count me in. That wall looks like a public convenience. And I am all for affordable housing. What a mad, bloody pointless demolition! Proof again that our local council Jobsworths all study at the Genghis Khan school of architectural preservation. Sounds like a project the Australian Government should be involved with. I shall post your blog on some Australian sites in London. 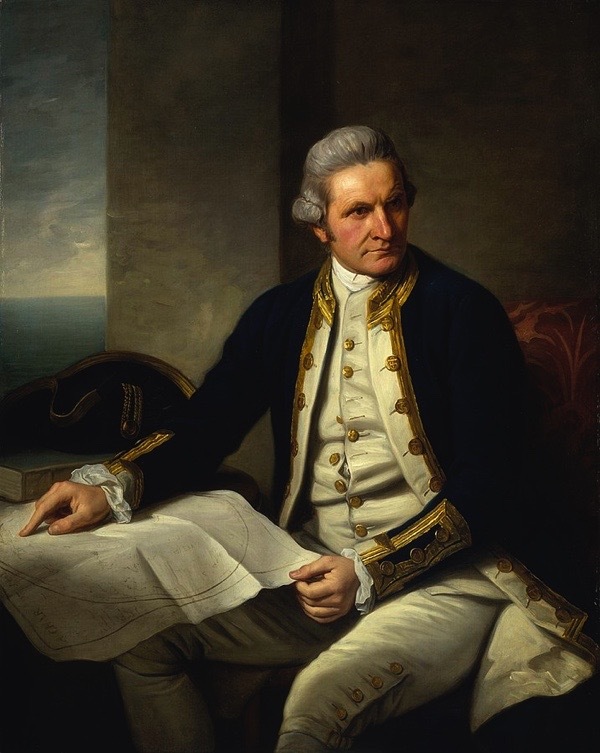 Thank you for today’s blog about Captain James Cook’s home. What absolute philistines they were to have demolished the captain’s old home. There needs to be something done to make up for this terrible vandalism! What wicked vandalism. What a dreadful life his widow had. It’s also so interesting to note the evolution of the house next door (to the east)… it’s ‘reinstated’ upper storey and reincarnated shop out front looking so new and modern in 1940. With The Blitz not starting until September that year, I’m left wondering what trouble if not tragedy befell this place, while leaving the adjoining, former-Cook residence — with it’s 1880′s ‘shopfront’ then home to Morgan the Butcher-Poulterer — seemingly still intact. Today, the site of Cook’s former home in Shadwell (in the maritime hamlet of Ratcliffe, as was) — on The Highway near the north-east corner of what is now King Edward VII Memorial Park — is marked simply by a plaque on the western elevation of the gatehouse to the modern-day Free Trade Wharf. Nothing much remains of our most acclaimed navigator-explorer’s life here either. In July 1794, 453 homes and countless business premises were destroyed by The Ratcliffe Fire — the biggest and most devastating inferno in the 400 years between The Great Fire of 1666 and The 1940-41 Blitz — so little of the ‘early’ maritime and domestic architecture in this part of old Sailortown survives. In fact little of anything… There’s the later entrance arch to the East India Company’s ‘Free Trade Wharf’ and indeed their office quarters, now “The Listed Building” — both now re-versioned for 20-21st century living — but the place-name and it’s embodiment ‘on the ground’ has for the most part been wiped from the map. 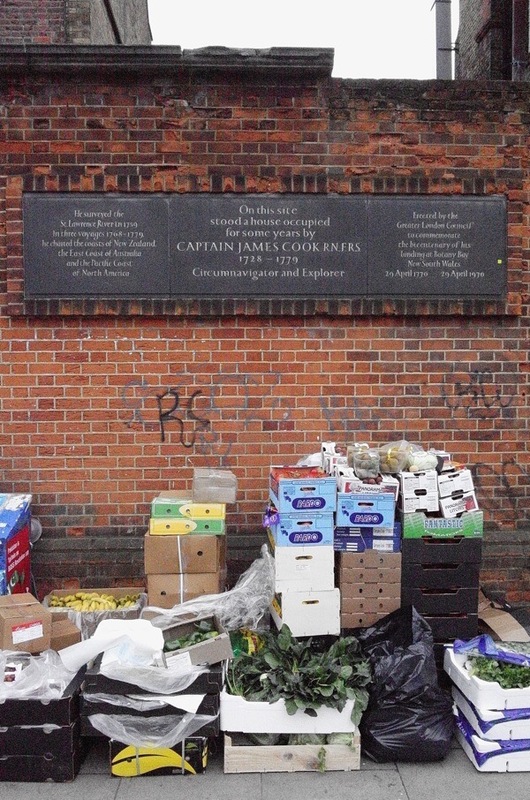 So how/where to now embed Cook, his Shadwell-Stepney life story including his ‘prodigy-successors’ such as William ‘Mutiny on The Bounty’ Bligh? Developing the £3million Park Masterplan. Let’s meet, talk and plan. Over the next few months, the Council will be appointing a design team to develop the detailed works to the park. The design team will be carrying out further consultation and we’d like to hear your views on how this should work. Tower Hamlets Parks has set up a meeting for Monday February 26th, 6.30pm at the Shadwell Centre to talk about how the next stage of consultation and design will work. Please come along on the 26th or let the team at Tower Hamlets know your ideas and observations by emailing kempproject@towerhamlets.gov.uk — this will also ensure you are adding to their KEMP mailing list. GA, I enjoyed the review of Captain Cook’s life and adventures by Gillian Tindall. He and his wife Elizabeth were certainly hardy souls. I’m with Paddy on this one – campaign for a statue instead. I do like the idea of a house, but the council don’t have the money to build anything themselves, so it would be up to private developers, and then it’d just end up another empty investment property. Rebuild the house with the right facade – that is the best thing for place making and reminding us of how we should be more careful with the heritage we have or we will lose it. No more statues to ‘great’ men! After all it was Elizabeth Cook who really lived there (and mourned all those she loved) and how does a statue of Cook have any meaning there? As we approach the 250th anniversary of his arrival in New Zealand and the East Coast of Australia, it is worth considering his extraordinary journey and what that gave to science and knowledge; also the beginning of the process that led to the First Fleet being dispatched to New South Wales arriving 18 years later and what that meant for the indigenous Australians. This would be nice thing to see, there is already a memorial to James Cook on the Big Island of Hawaii that marks the spot of this death on February 14, 1779. It’s a popular spot for snorkeling and is close the town of Captain Cook. Thank you for yet another compelling and little known story. I hope we hear a hopeful follow up of success one day. 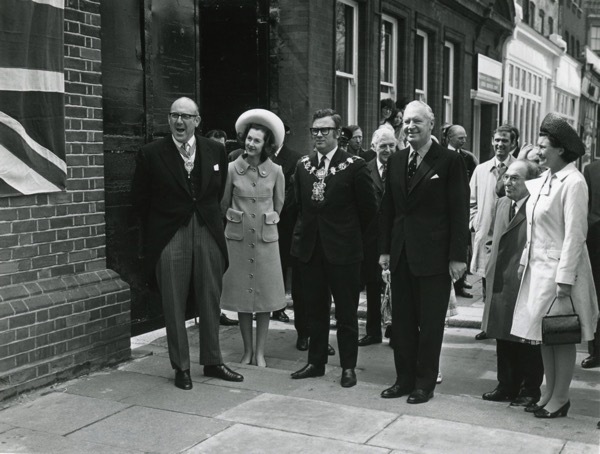 Countess Spencer in the plaque unveiling photo, wearing the large hat. I like the sound of the reconstructed house for those in need. Perhaps it could be included in a local scheme funded by a developer? Those local digniteries looking so pleased with themselves were probably looking forward to seeing their names on the wall in letters as big as those giving Captain Cook’s achievements. The mess in front of the wall should be cleared too. It shows no respect for the man and has no rights on that area of frontage. The council should step in here as they do in other areas. I once met a descendant of captain cook. A young photographer, living in London. I believe that prior to demolition Cook’s house was offered to Australia, in case they wanted to preserve it, as was done with the cottage from Great Ayton, now in Melbourne. But the offer was declined. Why couldn’t the site be offered for redevelopment on condition that its frontage is an exact replica of the old house front? There must be loads of people who would love to build their own house in London. At the moment it looks like a pissoir: an utter mess! So much for civic improvement in that part of the world! Honestly! How on earth could those dignitaries be so pleased with themselves for building such a monstrosity of a wall? That’s something I find very interesting: nowadays we have all these planners and architects and building standards, and rules & regulations, and what is produced is pure ugliness, whereas in the past, buildings were mostly decent, functional, human in scale and perfectly habitable. Who on earth could honestly argue that that vile wall as an ‘improvement’ on the nice little historic house with its plaque? Pulling the house down and then replacing it with nothing useful beggars belief. 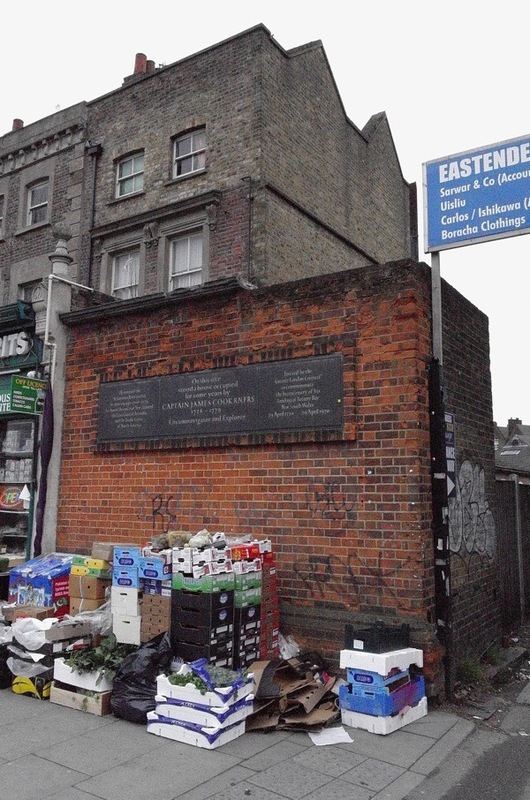 Putting up a plaque on that ugly wall is farcical, and I agree with Annie G, it certainly looks like a public convenience – with the windows bricked up. Bonkers! Glad to say that living in North Yorkshire, we take great pride in the Captain Cook heritage – even if his parents’ cottage was sold for £800 and taken to Melbourne in Australia. Wonderful post, interesting and informative, enjoyed the photos too, thank you.